Nanotechnology, popularly known as the science of small or scientifically described as the technology to develop materials and structures of the size range from 1 to 100 nanometres. Oncologists all over the globe, relentlessly research on methodologies for early detection of cancer and precise localization of cancer therapeutics (radiation/chemotherapy) with minimal adverse effects to healthy tissues. Since the previous decade, the fast growing research in nanotechnology has shown promising possibilities for achieving this dream of every oncologist. Since three to four years certain research efforts have been transformed into nanotech based products in pipeline (undergoing clinical trials) in early detection of cancer detection and cancer therapeutics. The aim of this review is provide the reader about both, the futuristic prospects of currently pursued cancer nanotechnology research and practical innovations arising out of successful research projects. The second half of the review consists of discussion on nanotech products in pipeline. In addition, various other interdisciplinary engineering marvels with potential of significant impact in cancer nanotechnology, have been mentioned in brief. Currently, nanomaterials are in the leading position (in comparison to futuristic nanotechnologies e.g., surgical nanomachines) in terms of extensive research, application and products in pipeline. The shape and dimensions of nanomaterials can be altered to obtain special capabilities, such as cellular membrane penetration. Size distribution plays a critical role, when the nanoparticles are engineered to exhibit their specialized physical properties such as optical absorbance and fluorescence. In contrast to nanomaterials for biomarker applications, specially engineered biomolecules have been developed (e.g., hairpin-shaped oligonucleotides), which consists of a fluorophore and quencher moiety. The oligonucleotides behave like switches, where if they undergo conformational changes by intermolecular interactions, the hairpin structure is opened separating the quencher and fluorophore moiety resulting in fluorescence. In spite of the superior advantage of such engineered biomolecules, they currently face a challenge to strike a balance between cost-effectiveness and performance reliability. The reports of cancer diagnostics and therapeutics based on nanomaterials research and upcoming products in pipeline have been mentioned in [Table - 1][Table - 2], respectively. The optical detection technique (Fluorescence and UV-vis absorption methods) is the most commonly used technique to detect presence of cancer and image cancer tissues with the assistance of biomarker or functionalized nanomaterials; where nanoparticles should either fluoresce or change their optical properties, when they bind to cancer-affected tissues such as silica nanoparticles doped with organic-based fluorescent dyes for detection of liver cell malignancy. Colloidal CdSe/ZnS-semiconductor nanocrystals (better known as quantum dots) due to their unique physical and photochemical properties have been widely used in in-vivo and in-vitro biological experiments. Larabell et al , utilized quantum dots for conducting cell motility assay and realized the potential of quantum dots to study cell-signaling events involved in migration and differentiate between invasive and noninvasive cancer cell lines. In addition, Escude et al have used the fluorescence signals from multicolored quantum dots for studying the position and orientation of individual DNA molecules. This methodology can be used to study the variation and existence of oncogenes. The quantum dots have been incorporated into cationic liposomes for intracellular labeling and imaging applications. Akiyoshi et al , have developed such hybrid nanoparticles to study cancer affected cells at a intracellular level in order to screen various chemotherapeutic candidates and understand their pharmacology. Due to in-depth research conducted on the optical properties of quantum dots, scientists have modified these properties for providing near infra-red florescence for sentinel lymph node mapping., This technique helped in improvised tracing and identification of affected lymph nodes and significantly reduced pain and the cost of pathology tests required. In addition, there was a significant decrease in major side-effects of breast cancer surgery during routine lymph node removal in breast cancer patients. Even with new advents in novel nanomaterials, medical professionals all over the globe, still prefer to use nanoparticulate formulation of conventionally used magnetic and paramagnetic materialsdue to its long associated clinical familiarity with the medical professional and well-established performance in both MRI imaging and mapping of malignant tissues. There have been successful attempts where nano-sized and multifunctional particles of iron oxide and gadolinium (G6) compounds have been developed by conjugating them with additional chemical entities and/or materials to make them multifunctional. Kobayashi and co-workers have used nano-sized formulation of G6 for studying lymphatic drainage by MRI imaging for understanding the metastases of breast cancer. Similarly Fukumori et al have encapsulated gadolinium in chitosan nanoparticles for neuron capture therapy of cancer. Zhang et al , had succeeded in developing a "nanoprobe" consisting of PEG (Polyethylene Glyocol)-coated iron oxide nanoparticles further functionalized with chlorotoxin and near IR fluorescing molecule Cy5.5. These nanoprobes had preferential uptake in glioma cells and were used for real-time imaging and correlation of preoperative images with intraoperative pathology of gliomas at cellular-level resolution. The advent of nanotechnology in cancer therapy, commenced when diagnostic, chemotherapeutic, antiangiogenesis and gene therapy agents (Engineered Oligonucleotides), were incorporated into nano-sized particles or encapsulation within nano-sized vesicles. The advantage of sub micron-sized particles (nanometer range and below one micron) is longer duration of circulation time and sustained drug release for improved therapeutic index and reduced toxicity. But time and again scientists and clinicians had to face many challenges of maintaining the therapeutic performance of such novel nano-sized formulations. There are certain exceptions, where micron-sized drug formulations were proven to be more effective than its nano-sized counterpart. A good example would be the poly(lactic-co-glycolic acid) (PLGA)-methoxy Polyethylene Glycol (mPEG) nanoparticles of cisplatin developed by Avgoustakis et al , which demonstrated a prolonged cisplatin residence in systemic blood circulation, during its clinical studies. The nano-sized formulation possessed the drawback of decreased loading efficiency for therapeutic applications. Later, scientists and clinicians researched on various encapsulation methods of degradable starch microspheres in an aqueous crystal suspension to intensify intra-arterial chemotherapy of head and neck cancer with high-dose cisplatin. Subsequently another new method of chemoembolization was established to eliminate drawbacks of previous formulation methods and permitted the usage of low drug doses. Because of early occlusion of the small head and neck vessels and danger of local damage. The biodegradable 6-carboxylcellulose polymer (cisplatin-depot) has also been used in patients with glioblastoma multiforme. Using innovative chemical engineering techniques, CritiTech Inc. have developed proprietary method of Precipitation with Compressed Antisolvent using supercritical carbon dioxide for pilot plant scale and large scale manufacturability of sub-micron nanoparticles of Paclitaxel. This novel formulation has exhibited promising results of increased survival of tumor -bearing mice to 180 days in comparison to 105 days of tumor-bearing mice treated with regular Paclitaxel formulated with Cremophor®. This innovation named as Nanotax®, is undergoing Phase 1 clinical trials, for ovarian and pancreatic cancer, which would be administered by intraperitoneal route. Dabur India has a similar formulation undergoing phase III trails (personal communication). The recent report published in Nature by Sasisekaran et al , where his team developed "nanocells" targeted to malignant tissues, is considered to be one of the most innovative multi-functional and intelligent drug delivery methods. This "nanocell" has an outer envelope to be absorbed by the tumor cell and to release an anti-angiogenesis agent for shutdown of blood supply to the tumor and inner nanoparticle release chemotherapeutic agent. This integrative approach to cancer therapy also reduces the drawbacks of receiving decreased therapeutic concentration of chemotherapeutic agent by antiangiogenesis and the increased tumour invasiveness and resistance to chemotherapy caused by over expression of (HIF1-alpha). Other similar innovations include specially specifically engineered nanovectors for tumor-specific gene delivery. The advent of novel cancer therapeutics from nanotechnology has slowly evolved from nanoencapsulated drug formulations to nano-sized functional nanoparticles. Such functional nanoparticles are engineered to ensure delivery of ionizing radiation, chemotherapeutic agents or thermal dose specifically to malignant tissues. Most of these functional nanomaterials (nonradioactive in nature) have been used in hyperthermia. Composite metal nanoshells, have been one of the few earliest candidates for infra-red hyperthermia. The dimensions of the nanoshells can be altered to provide optical resonance, which can systematically varied from near-UV to the mid-infrared. While biocompatible and target specific superparamagnetic and fine ferrimagnetic particles such as Fe3O4, have successfully demonstrated hyperthermia by inducing heat under the influence of a strong alternating magnetic field. In addition, improvised success rate was observed in the case of magnetic fluid (ferrofluid) hyperthermia, where magnetic nanoparticles are incorporated in a carrier liquid, to easily perfuse in targeted tissues. PSivida a nanotech company has initiated the Phase II trials of its product "BrachySil" for patients with liver and pancreatic malignancies. Nanoparticles of silicon impregnated with the radioactive isotope of phosphorus P.BrachySil is injected directly into the cancer using a fine gauge needle. Later, the silicon breaks down and gets excreted. P, which has a half-life of 14 days, eventually decomposes to stable isotopes or is excreted. Because the treatment is localized, the side effects are likely to be less than other forms of brachytherapy. Popularly known as colloidal gold and nanogold. The multifaceted abilities of gold have been investigated in-depth right from electronics industry to medicinal formulations of both modern and traditional practices. This multifaceted aspect of gold nanoparticles hasbeen successfully demonstrated in both diagnostics and treatment of cancer. Compared to many previously mentioned nanomaterials, the synthesis of gold nanoparticles is much simpler and also pose minimal toxicity to kidney and liver, where it accumulates after entering in the systemic circulation. Optical properties of nanogold is based on the surface plasmon resonance, has been harnessed to provide photodynamic therapy of malignant tissues. Using short laser pulses focused on monoclonal antibodies conjugated with light-absorbing microparticles and nanoparticles. Pitsillides and co-workers reported a improvised methodology for selective cell targeting and providing highly localized cell damage by photodynamic therapy. Nanogold has shown to have 600 times more absorption in cancer cells than normal human cells. This and the optical property of nanogold to absorb and scatter light has been utilized by El-Sayed et al to demonstrate the detection and imaging of malignant cells. El-Sayed et al conjugated the anti-body of Epidermal Growth Factor Receptor, which is only expressed by malignant cells onto nanogold. After the absorbtion of the nanogold-anti EGFR conjugate into the cancer cells, the cells were reported to be "shining" in dark field microscopy. The ability of gold nanoparticles to strongly bind with biological molecules, has been utilized to target cancer tissues by tagging the nanoparticle with a suitable antibody. This antibody-nanogold conjugate are used as vectors for delivering drug molecules or ionizing radiation in the form of radioactive nanogold. Currently the research pursued by Dr. Katti and co-workers in development of hybrid Gold-198/199 nanoparticulates will deliver effective therapeutic response for treating prostate cancer. Higher therapeutic dose is ensured when nanoparticles of the β emitting Gold 198/199 are used. The Hybrid Au-198/199 nanoparticulate conjugates are being prepared by conjugation with prostate cancer specific bombesin peptide analogs. These peptides have high affinity toward receptors on prostate, breast and small cell lung cancer cells. Many cytotoxic cancer therapeutic drugs have a major disadvantage when longer periods of time, is concerned with its acute toxicity. Dr. Katti and his group have recently developed a new class of Au (I) phosphine complexes. Have demonstrated cytotoxicity against human androgen independent prostatic carcinoma (PC-3 cell line), human androgen dependent carcinoma (LNCap. FGC cell line), human colon carcinoma cells (HCT-15 cell lines) and human gastric carcinoma (AGS). Subsequently antibiotic coated nanogold for sustained release and functionalized nanogold for mammalian cell transfection, have been developed. Recent reports mention certain unique intrinsic capabilities of gold nanoparticles in X-ray radiotherapy enhancement in mice-bearing EMT-6 mammary carcinomas. Similarly anti-angiogenesis action, was observed when gold nanoparticles interact selectively with heparin-binding glycoproteins and inhibit angiogenesis. CytImmune Sciences, Inc. (College Park, MD) is partnering with Octo-Plus (Leiden, the Netherlands) to use colloid gold as a means to deliver the anticancer protein, tumor necrosis factor (TNF), known as Aurimune-T™. The scientists have used innovative methods to avoid being detected by the immune system by placing linear pieces of PEG in between the TNF molecule. They also discovered that the toxicity of biomolecules could be drastically reduced when bound to colloidal gold. Once these particles are in the blood stream they get engulfed in water resulting in a "stealth" effect. The particle size of nanogold is 25 nanometers, small enough to pass through the blood vessels of the tumor (around 100nm in diameter) and large enough to pass through blood vessels of healthy organs (5nm in diameter). The Phase I trials have already commenced in late 2003. In 1959, Late Nobel Laurete physicist Dr. Feyman, proposed the concept of developing tools to fabricate smaller tools, again to fabricate smaller structures, this would continue till fabrication level is possible at the atomic level. "Bottom-Up Synthesis" where molecular components are formed by arrangement of special ordered arrangement of carbon and silicon-based molecules. Similar to a methodology of automobile assembly line, the molecular components are assembled into a nanomachine. Drexler proposed the concept of a molecular assembler which could assemble the nanomachines or make copies of themselves., Martel and co-workers have investigated using a group of independently mobile wireless instrumented microrobot manipulators called Nano-Walkers, to collectively form a nanofactory system to be used for positional manufacturing operations. Nanomachines with the ability to manipulate cellular organelles and deliver therapeutics or conduct surgery at cellular level, are still at the research phase. Such nanobots would have to be fabricated by assembling its nano-sized components made comprised of. Successful attempts at research stageshave been carried out to control the mechanical parts of the nanobots and to maneuver them in the desired path using forces from magnetic fields [Table - 3]. > Nano and micro-sized systems for diagnosis, treatment and invasive procedures. In comparison to the intended application of futuristic surgical nanomachines, similar functions can be carried out by devices based on micro/submicron technologies using silicon or engineered polymers. The existence of advanced and low cost semiconductor and microchip manufacturing technologies has provided scientists and researchers to develop micron-sized sensors and actuator systems known as micro/nano electro-mechanical systems (MEMS and NEMS). Collaborative research endeavors are being initiated to develop a prototype nanoscale assembler, using a NEMS developed by micro-scale scale technologies (Concept of Feyman Nanotechnology). Zyvex Corp. (www.zyvex.com) of Richardson, TX has a $25 million, five-year, National Institute of Standards and Technology (NIST) contract to develop prototype micro-scale assemblers using MEMS. Such systems have been used as a diagnostic tool in cancer therapy, by incorporation of novel-functional or novel-shaped nanomaterials and biomolecular markers, Popularly known as nano/microsensor chips and Bio-chips such as the DNA chip. Nanoscale devices are developed to manipulate biomolecules and also interface with complex biological systems. This makes possible to study the fundamental biological mechanisms that dictate health and disease. This opens a new horizon where nanomedicines can be synthesized based on the cell-molecular machinery and signal transduction mechanisms, artificial cells, targeted molecular drug delivery combined with therapeutic imaging. Multiple biochemical pathways are performed to translate the molecular code on the oncogene into a malignant tissue. Detection or identification of the key molecules in such pathways is often difficult using engineered molecules, or integrating engineered molecules into Silicon Microsystems (Biosensors). Instead a living cell can be integrated in a microsystem as the primary transduction mechanism. The cells would detect the key bio-chemicals, as they themselves are chemical factories/labs laboratories and can amplify a chemical signal. This can be detected by either monitoring physical parameters (such as electrical activity, structural changes) or chemical parameters (production of "messenger" molecules). Though limitations to incorporate such microsystems would include robustness of the living cells, possible contamination by cell/bacteria in the body and short life cycle of the cells. Still it has demonstrated a considerable good performance for in-vitro studies. For example: One sensor uses chick myocardial cells to detect the presence of epinephrine, verapamil and tetrodotoxin in the cell environment. Limitations of cell-based sensors include the lifetime and robustness of the cells. Malignant tissues and tumors, such as squamous cell carcinoma are difficult to remove during surgical treatment due to their hardness. Even by using microactuators to surgically interact with such tissues would rather be less effective as are unable to withstand forces on the scale of ~1 mN. Instead Ultrasonic Piezoelectric actuators attached to the scalpel /surgical cutter, resonate at the tip of the tool at ultrasonic frequencies, to assist in rapidly cutting through tough and hardened malignant tissues. Similarly Kirson and co-workers have developed a vibrating micropipettes (100 Hz and < 1-mm tip diameter) that can completely cut dendrites from single neurons without affecting cell viability. Micro-strip (micro-millimeter size range) antennas based on the MEMS technology have been developed for hyperthermia applications by Bernhard and co-workers. The small size and novel structuring of the antennas provide enhanced focusing of the RF (Radio-Frequency) /Microwave radiation for effective heat treatment of the tumors. The incorporation of MEMS/NEMS (novel semiconductor devices) for monitoring and management of neuronal activity., Here Varadan and co-workers have used an implantable MEMS/NEMS- (Electro-active polymer actuators and microsensors attached to the body) based electrodes wirelessly connected to a sensor network for feedback control mechanism. This was for Deep Brain Stimulation for patients suffering from Parkinson's disease, epilepsy etc. When the sensors sense an abnormal motor activity in the patient, the sensors provide necessary control pulses, which are processed to actuate the implanted actuator in order to control the abnormal activity. This technology can be extended towards pain control and management, for patients suffering from chronic pain during cancer therapy sessions. The biggest advantage being that such wirelessly communicated systems can monitor pain condition of patients via internet, cell phones and PDAs. This would assist medical professionals to tackle patient problems in emergency cases with limited medical staff. The recently developed "smart pill" (26 mm x 36 mm) an ingestible medical device for imaging and studying the gastro-intestinal tract began its clinical testing in late 2005. This technology based on advanced semi-conductor technology can be used for studying GIT malignancies more closely and conveniently than conventional endoscopy. With the advancement of MEMS, NEMS and nanoelectronics there is room for enhancement of maneuvering, signal/image-processing, image-capturing and wireless signal transmission from the "smart pill". In this case size reduction (beyond optimum size) can be considered by increasing the performance and stability of the device. On similar lines of the "smart pill", miniaturized millimeter-sized remotely controlled devices known as "nanorobots", can reach out to inaccessible locations in the human body to obtain high resolution images and diagnose cancer/take tissue samples for biopsy. Currently Prof. Moshe Shoham's Group at Technion Israel is developing a nanorobot for studying the spinal fractures. (Reported in Daily Mail UK 14th November 2006 in a article titled "Robot that swims up your spine to take pictures of fractures" By Roger Dobson). Their group has developed their own version of the "smart pill" known as Pilcam. While Adriano Cavalcanti and co-workers are using an innovative approach to develop a nanorobot for diagnosis of cancer before metastases. They plan to incorporate a higher gradient of signal intensity of E-cadherin for chemical parameter identification in guiding nanorobots to identify malignant tissues. The nanorobot would use chemical signals and targeted proteins improve treatment intervention time to identify tumor cells. The group has also developed a virtual reality using clinical data coupled with a real time 3-D environment for validation of their model. In the near future, the multipurpose nano/microrobots would be equipped with nano/micro-sized instruments for minimal and safe invasive treatment and diagnostic procedures. The accessory instruments of imaging and wireless operation would enable us to conduct real time study of administered therapeutics and treatment procedures,,,,,,, [Table - 4]. When interdisciplinary innovations from basic sciences and applied engineering are included with nanotechnology, it results in development of miniaturized and low cost instruments for cancer treatment and diagnostics. The best example is of Dr. Otto Zhou and his co-workers from the University of North Carolina Chapel Hill, who are optimizing their new technology of carbon nanotube (CNT) based X-ray machines, which is smaller in size, low in cost and provides clearer images and operates at lower temperatures as compared to metallic filaments in conventional X-ray machines. In 2000, after filing the first patent on CNT-based X-ray source, Zhou et al co-founded a company, Xintek, to develop and commercialize the technology. CNT due to small diameters (in nanometers) easily emits electrons when a small voltage is applied, resulting in low temperature requirement for field emission. Similarly by engineering CNTs physical and chemical properties, has made CNT become a potential promising candidate for cellular research and cell level therapeutics. They have shown to be engulfed intracellular by endocytosis and functionalized versions of such CNT's have demonstrated photothermal ablation of cancer cells during in-vitro studies. Nanotechnology-based cancer therapeutics and diagnostics, over the past decade, has evolved from nano-sized drug particles to functional nanomaterials that are capable of delivering heat, ionizing radiation and chemotherapeutic agents. Currently these are the only nanotechnology innovations that are feasible in terms of improvised treatment and cost-effectiveness. By incorporating multidisciplinary engineering innovations in nanotechnology, an avenue for development of enhanced, miniaturized and low cost diagnostic/imaging instruments and treatment machines has opened. The future possibility of tackling "pain- the bitter side of cancer therapy", through nanotechnology would be considered one of the biggest breakthroughs. The investments for research and development and performance trials are considerably large. Hence the sponsoring agencies both private and government should develop innovative management and economic strategies to make these nanotechnology innovations more cost-effective and ease of availability for patients across all economic classes. Similar approach is advised for the upcoming miniaturized technologies (within sub millimeter and sub-micron) from diverse and interdisciplinary engineering sectors of electronics, mechanical and robotics, which can open new horizons in revolutionizing existing methods of cancer study, diagnosis and treatment. Strong initiatives and new evolved policies should be formed by the Health Departments in collaborations with relevant government or private organizations to provide subsidized cancer nanotechnology therapeutics. The subsidy should also be extended to innovations from non-nanotechnology sector, which support and/or enhance the performance of cancer nanotechnology innovations. Studies on the clinical and environmental safety aspects should be conducted extensively. Also predictive models must be developed to forecast long-term toxicities and future possible hazards of nanotechnology innovations that are proven clinically and environmentally safe. This would assist relevant environmental and health safety enforcement bodies to counter any possible near or future threats. It is imperative that relevant ethical issues must be discussed and suitable policies be introduced to avoid violation of human and animal safety norms. The cancer nanotechnology innovations that comply with clinical and environmental safety norms, should be recognized by Medical Insurance Schemes. This would enable medical insurance policy holders to avail benefits of new, upcoming and safe cancer nanotechnology innovations. The future holds lot of promises as nanotechnology has the potential to provide cancer therapy by challenging the barriers of prohibitive costs and undesirable side-effects. The authors want to thank the Indian Council of Medical Research for the funding. 1. Salata O. Applications of nanoparticles in biology and medicine. J Nanobiotechnol 2004;2:3. 2. Sinani VA, Koktysh DS, Yun BG, Matts RL, Pappas TC, Motamedi M, et al . Collagen coating promotes biocompatibility of semiconductor nanoparticles in stratified LBL films. Nano Lett 2003;3:1177-82. 3. Zhang Y, Kohler N, Zhang M. Surface modification of superparamagnetic magnetite nanoparticles and their intracellular uptake. Biomaterials 2002;23:1553-61. 4. Cuenca AG, Jiang H, Hochwald SN, Delano M, Cance WG, Grobmyer SR. 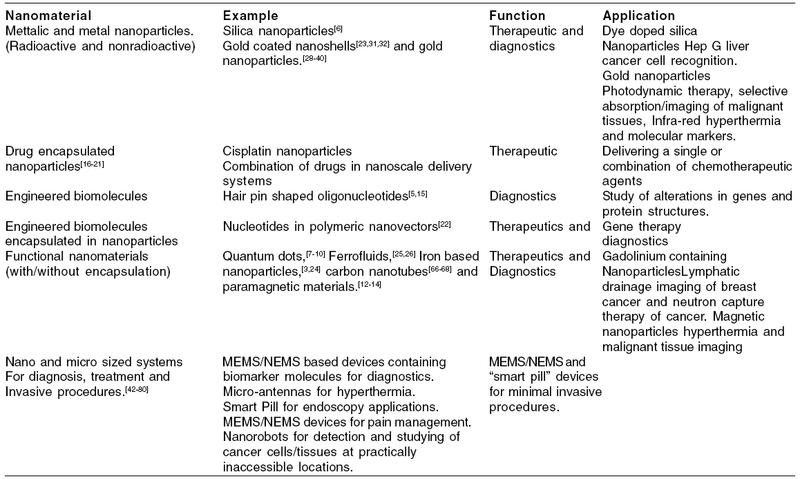 Emerging implications of nanotechnology on cancer diagnostics and therapeutics. Cancer 2006;107:459-66. 5. Tan L, Li Y, Drake TJ, Moroz L, Wang K, Li J, et al . Molecular beacons for bioanalytical applications. Analyst 2005;130:1002-5. 6. He X, Duan J, Wang K, Tan W, Lin X, He C. A novel fluorescent label based on organic dye-doped silica nanoparticles for HepG liver cancer cell recognition. J Nanosci Nanotechnol 2004;4:6:585-9. 7. Gu W, Pellegrino T, Parak WJ, Boudreau R, Le Gros MA, Gerion D, et al. Quantum Dot-Based Cell Motility Assay. Signal Transduction Knwoledge Environment (STKE) 2005. p. 15. 8. Crut A, Geron-Landre B, Bonnet I, Bonneau S, Desbiolles P, Escude C. Detection of single DNA molecules by multicolor quantum-dot end-labeling. Nucleic Acids Res 2005;33:e98. 9. Hasegawa U, Nomura SM, Kaul SC, Hirano T, Akiyoshi K. Nanogel-quantum dot hybrid nanoparticles for live cell imaging. Biochem Biophys Res Commun 2005;331:917-21. 10. Kim S, Lim YT, Soltesz EG, De Grand AM, Lee J, Nakayama A, et al. Near-infrared fluorescent type II quantum dots for sentinel lymph node mapping. Nat Biotechnol 2004;22:93-7. 11. Sentinel Lymph Node Mapping Proven Effective in Predicting Spread of Breast Cancer. Taken from the 1998 Press release from the website of University of Pennsylvania Health System. 12. Kobayashi H, Kawamoto S, Sakai Y, Choyke PL, Star RA, Brechbiel MW, et al. Lymphatic drainage imaging of breast cancer in mice by micro-magnetic resonance lymphangiography using a nano-size paramagnetic contrast agent. J Natl Cancer Inst 2004;96:703-8. 13. Shikata F, Tokumitsu H, Ichikawa H, Fukumori Y. In vitro cellular accumulation of gadolinium incorporated into chitosan nanoparticles designed for neutron-capture therapy of cancer. Eur J Pharm Biopharm 2002;53:57-63. 14. Veiseh O, Sun C, Gunn J, Kohler N, Gabikian P, Lee D, et al. Optical and MRI multifunctional nanoprobe for targeting gliomas. Nano Lett 2005;5:1003-8. 15. Maksimenko A, Malvy C, Lambert G, Bertrand JR, Fattal E, Maccario J, et al . Oligonucleotides targeted against a junction oncogene are made efficient by nanotechnologies. Pharm Res 2003;20:1565-7. 16. Avgoustakis K, Beletsi A, Panagi Z, Klepetsanis P, Karydas AG, Ithakissios DS. PLGA-mPEG nanoparticles of cisplatin: In vitro nanoparticle degradation, in vitro drug release and in vivo drug residence in blood properties. J Control Release 2002;79:123-35. 17. Boulikas T, Vougiouka M. Cisplatin and platinum drugs at the molecular level (Review). Oncol Rep 2003;10:1663-82. 18. Kovacs AF, Turowski B. Chemoembolization of oral and oropharyngeal cancer using a high-dose cisplatin crystal suspension and degradable starch microspheres. Oral Oncol 2002;38:87-95. 19. Sheleg SV, Korotkevich EA, Zhavrid EA, Muravskaya GV, Smeyanovich AF, Shanko YG, et al. Local chemotherapy with cisplatin-depot for glioblastoma multiforme. J Neurooncol 2002;60:53-9. 21. Sengupta S, Eavarone D, Capila I, Zhao G, Watson N, Kiziltepe T, et al. Temporal targeting of tumour cells and neovasculature with a nanoscale delivery system. Nature 2005;436:568-72. 22. Kommareddy S, Tiwari SB, Amiji MM. Long-circulating polymeric nanovectors for tumor-selective gene delivery. Technol Cancer Res Treat 2005;4:615-25. 23. Loo C, Lin A, Hirsch L, Lee MH, Barton J, Halas N, et al. Nanoshell-enabled photonics-based imaging and therapy of cancer. Technol Cancer Res Treat 2004;3:33-40. 24. Giri J, Ray A, Dasgupta S, Datta D, Bahadur D. Investigation on Tc tuned nano particles of magnetic oxides for hyperthermia applications. Biomed Mater Eng 2003;13:4:387-99. 26. et al . Effects of Magnetic Fluid Hyperthermia (MFH) on C3H Mammary Carcinoma In Vivo. Int J Hyperther 1997;13:587-605. 27. Jordan A, Scholz R, Wust P, Fδhling H, Felix R. Magnetic fluid hyperthermia (MFH): Cancer treatment with AC magnetic field induced excitation of biocompatible superparamagnetic nanoparticles. J Magnet Magnetic Mat 1999;201:413-9. 29. Mathias BM, Walker M, Bethell D, Schiffrin DJ, Whyman R. Synthesis of Thiol-derivatised Gold Nanoparticles in a Two-phase Liquid-Liquid System. J Chem Soc Chem Commun 1994;801-2. 30. Hainfeld JF, Slatkin DN, Smilowitz HM. The use of gold nanoparticles to enhance radiotherapy in mice. Phys Med Biol 2004;49:N309-15. 31. Pitsillides CM, Joe EK, Wei X, Anderson RR, Lin CP. Selective cell targeting with light-absorbing microparticles and nanoparticles. Biophys J 2003;84:4023-32. 32. Hirsch LR, Stafford RJ, Bankson JA, Sershen SR, Rivera B, Price RE, et al. Nanoshell-mediated near-infrared thermal therapy of tumors under magnetic resonance guidance. Proc Natl Acad Sci USA 2003;100:13549-54. 33. Loo C, Lin A, Hirsch L, Lee MH, Barton J, Halas N, et al. Nanoshell-enabled photonics-based imaging and therapy of cancer. Technol Cancer Res Treat 2004;3:33-40. 34. El-Sayed IH, Huang X, El-Sayed MA. Surface plasmon resonance scattering and absorption of anti-EGFR antibody conjugated gold nanoparticles in cancer diagnostics: Applications in oral cancer. Nano Lett 2005;5:829-34. 35. Hainfeld JF, Powell RD. New Frontiers in Gold Labeling. J Histochem Cytochem 2000;48:471-80. 36. Hainfeld JF. Gold, electron microscopy and cancer therapy. Scanning Microsc 1995;9:239-56. 38. Dr. Katti's Research Interests. 39. Pillarsetty N, Katti KK, Hoffman TJ, Volkert WA, Katti KV, Kamei H, et al. In vitro and in vivo antitumor properties of Tetrakis ((trishydroxymethyl) phosphine) gold (I) chloride. J Med Chem 2003;46:1130-2. 40. Tom RT, Suryanarayanan V, Reddy PG, Baskaran S, Pradeep T. Ciprofloxacin-protected gold nanoparticles. Langmuir 2004;20:1909-14. 41. Sandhu KK, McIntosh CM, Simard JM, Smith SW, Rotello VM. Gold nanoparticle-mediated transfection of mammalian cells. Bioconjugate Chem 2002;13:3-6. 42. Mukherjee P, Bhattacharya R, Wang P, Wang L, Basu S, Nagy JA, et al. Antiangiogenic properties of gold nanoparticles. Clin Cancer Res 2005;11:9:3530-4. 44. Feynman RP. There's plenty of room at the bottom. Eng Sci 1960;23:22-36. 45. Drexler KE. Nanosystems: Molecular machinery, manufacturing and computation. John Wiley and Sons: New York; 1992. 46. Freitas Jr RA, Merkle RC. Kinematic self-replicating machines. Landes Bioscience: Georgetown (TX); 2004. 47. Martel S, Hunter I. Nanofactories based on a fleet of scientific instruments configured as miniature autonomous robots. Proceedings of the 3rd International Workshop on Microfactories: USA; 2002. p. 97-100. 48. Freitas RA Jr. Nanotechnology, nanomedicine and nanosurgery. Int J Surg 2005. 49. Ishiyama K, Sendoh M, Arai KI. Magnetic micromachines for medical applications. J Magn Magn Mater 2002;242e245:1163-5. 50. Mathieu JB, Martel S, Yahia L, Soulez G, Beaudoin G. MRI systems as a mean of propulsion for a microdevice in blood vessels. Proceedings of 25th annual international conference of the IEEE engineering in medicine and biology: Mexico; 2003. p. 17-21. 51. Nelson B, Rajamani R. Biomedical micro-robotic system. In : 8th International conference on medical image computing and computer assisted intervention. MICCAI: USA; 2005. p. 26-9. Available from: http://www. miccai2005.org. 53. Kohli V, Elezzabi AY, Acker JP. Cell nanosurgery using ultrashort (femtosecond) laser pulses: Applications to membrane surgery and cell isolation. Lasers Surg Med 2005;37:227-30. 54. Sacconi L, Tolic-Norrelykke IM, Antolini R, Pavone FS. Combined intracellular three-dimensional imaging and selective nanosurgery by a nonlinear microscope. J Biomed Opt 2005;10:14002. 55. Tirlapur UK, Konig K. Femtosecond near-infrared laser pulses as a versatile non-invasive tool for intra-tissue nanoprocessing in plants without compromising viability. Plant J 2002;31:365-74. 56. Konig K, Riemann I, Fischer P, Halbhuber KJ. Intracellular nanosurgery with near infrared femtosecond laser pulses. Cell Mol Biol (Noisy-le-grand) 1999;45:195-201. 57. Stipp D, Gene Chip Breakthrough. Fortune March 31, 1997. 58. BioMEMS: Bridging Nano and Micro to Link Diagnostics to Treatment. Professor Abraham P. Lee. Department of Biomedical Engineering. Proceedings at Acero Inc. Available from: http: //www.acreo.se/upload/Publications/Proceedings/OE02/abstract-lee.pdf. 59. Zheng G, Patolsky F, Cui Y, Wang WU, Lieber CM. Multiplexed electrical detection of cancer markers with nanowire sensor arrays. Nat Biotechnol 2005;23:1294-301. 60. Otto AM, Brischwein M, Niendorf A, Henning T, Motrescu E, Wolf B. Microphysiological testing for chemosensitivity of living tumor cells with multiparametric microsensor chips. Cancer Detect Prev 2003;27:291-6. 61. Carlier J, Arscott S, Thomy V, Camart JC, Cren-Olive C, Le Gac S. Integrated microfabricated systems including a purification module and an on-chip nano electrospray ionization interface for biological analysis. J Chromatogr A 2005;1071:213-22. 62. Wee KW, Kang GY, Park J, Kang JY, Yoon DS, Park JH, et al. Novel electrical detection of label-free disease marker proteins using piezoresistive self-sensing micro-cantilevers. Biosens Bioelectron 2005;20:1932-8. 63. Stieve H. Sensors of biological organisms -biological transducers. Sensors Actuators 1983;4:689-704. 64. Borkholder DA. Cell-based biosensors using microelectrodes. Ph.D. Thesis, Electrical Engineering Department, Stanford University: Stanford, CA; 1998. 65. Lal A. Silicon-based ultrasonic surgical actuators. Proceedings of the 20th Annual International Conference of the IEEE Engineering in Medicine and Biology Society. 1998. p. 2785-90. 66. Kirson ED, Yaari Y. A novel technique for micro-dissection of neuronal processes. J Neurosci Methods 2000;98:119-22. 67. Bernhard JT, Jones EA, Samulski TV, Clegg ST, Joines WT. Design guide for the spiral microstrip antenna in hyperthermia applications. Presented at the 15th Annual Meeting of the North American Hyperthermia Society. 1995. 68. Najafi K. Solid-state microsensors for cortical nerve recordings. IEEE Engg Med Biol Magazine 1994;13:375-87. 69. Kovacs GT, Storment CW, Halks-Miller M, Belczynski CR Jr, Della Santina CC, Lewis ER, et al. Silicon-substrate microelectrode arrays for parallel recording of neural activity in peripheral and cranial nerves. IEEE Trans Biomed Eng 1994;41:567-77. 70. Varadan VK, Harbaugh R, Abraham JK. Deep-brain stimulator and-control of Parkinson's disease. Congrθs Smart electronics, MEMS, bioMEMS and nanotechnology. San Diego CA; 2004. Available from: http://www.smartpillcorp.com. 71. Cavalcanti A, Shirinzadeh B, Hogg T, Kretly LC. CMOS-based Nanorobot to Combat Cancer. AWFM06 2006 - COSNet Australian Workshop on Fluid Mechanics, A Complex Dynamical System. 72. Cavalcanti A, Hogg T, Shirinzadeh B, Liaw HC. Nanorobot Communication Techniques: A Comprehensive Tutorial. IEEE ICARCV Int'l Conf. on Control, Automation, Robotics and Vision. December 2006. 73. Cavalcanti A, Freitas RA Jr. Nanorobotics Control Design: A Collective Behavior Approach for Medicine. IEEE Trans NanoBioScience 2005;4:133-40. 74. Judy JW. Biomedical Applications of MEMS, Measurement Science and Technology Conference: Anaheim, CA; 2000. p. 403-14. 75. Rose SC, Hassanein TI, Bouvet M, Hart ME, Khanna A, Saville MW. Delivery of radiofrequency ablation probes to the targeted liver malignancy: Using all the players on the field. J Vasc Int Radiol 2002;13:1060-1. 76. Park JH, Park JW, Yoon YK, Joung Y, Choi S, Lee J, et al. Wireless thermal micro-ablation of skin for transdermal drug delivery. BMES Conference: Baltimore, MD, USA; 2005. 77. U.S. Patent 5,629,577 - Piezoelectric microactuator useful in a force-balanced scalpel. 78. Talbot NH, Pisano AP. Polymolding: Two wafer polysilicon micromolding of closed-flow passages for microneedles and microfluidic devices. Solid-State Sensor and Actuator Workshop Technical Digest, Hilton Head Island, SC, USA; 1998. p. 265-8. 79. Ward S, Melodie FM, Thomas WS, Maitland DJ. Laser activated shape memory polymer microactuator for treating ischemic stroke: Preliminary in vitro analysis. Lasers Surg Med 2002;30:1-11. 80. Lee AP, Ciarlo DR, Krulevitch PA, Lehew S, Trevino J, Northrup MA. A Practical Microgripper by Fine Alignment, Eutectic Bonding and SMA Actuation. Proceedings of International Solid-State Sensors and Actuators Conference. Transducers: Stockholm, Sweden; 1995. p. 368-71. 81. Pan Y, Xie H, Fedder GK. Endoscopic optical coherence tomography based on a microelectromechanical mirror. Optics Letters 2001;26:1966-8. 82. Yue GZ, Qiu Q, Gao B, Cheng Y, Zhang J, Shimoda H, et al. Generating of continuous and pulsed and diagnostics imaging X-ray radiation using a carbon-nanotube-based filed-emission cathode. Appl Phys Lett 2002;84:355-7. 83. Kam NW, Dai H. Carbon nanotubes as intracellular protein transporters: Genetically and biological functionality. J Am Chem Soc 2005;127:6024-6. 84. Kam NW, O'Connell M, Wusdom JA, Dai H. Carbon nanotubes as multifunctional biological transporters and near infra-red agents for selective cancer cell destruction. Proc Natl Acad Sci USA 2005;102:11600-5. 85. Sprintz M, Benedetti C, Ferrari M. Applied nanotechnology for the management of breakthrough cancer pain. Minerva Anestesiol 2005;71:419-23. 86. Hede S. Molecular materials and its technology: Disruptive impact on industrial and socio-economic areas. Artificial Intelligence and Society. September 2006. Mantri, S.S. and Mantri, S.
Kurek, N.S. and Chandra, S.B. Xue, X. and Liang, X.-J. Butle, S.R. and Baheti, P.R. Arvizo, R., Bhattacharya, R., Mukherjee, P.
Ma, J., Wang, J.-N., Tsai, C.-J., Nussinov, R., Ma, B.
Retèl, V.P., Hummel, M.J.M., van Harten, W.H. Cavalcanti, A. and Shirinzadeh, B. and Freitas, RA and Hogg, T.
Jabr-Milane, L.S., van Vlerken, L.E., Yadav, S., Amiji, M.M. Cavalcanti, A., Shirinzadeh, B., Kretly, L.C. Cavalcanti, A., Shirinzadeh, B., Zhang, M., Kretly, L.C.